I don’t normally endorse or plug specific organisations mainly because I like to have an objective view and many of us can be unaware of greenwashing before we find out the reality of a good or service, but I can see that this type of forum is quite unique in Australia. I had a look around the site and even though it has only just been created about a month ago, there is quite a bit of information posted already. All fairly sound advice. There are a few other forum that I subscribe to like The Earth Garden Path, and Aussies Living Simply, and I put up a post once in a while. They are all great on-line communities, and are good portals for sharing information, which, unlike a blog which is one way converstation (besides comments of course), these forums are interactive. When you post for advice, you usually get relies back in droves, and 99% of the time you receive the answers you seek. Give them a go if you like. I have found them all to be a good source of information for those starting out on the path to a sustainable lifestyle. The little plastic greenhouse is nice and toasty warm. Today when I checked it at lunch time is was a wonderful 27 degrees C! The normal outside temperature was 11 so there is a very big differential between the inside and outside air temperatures. So much so, that two of the six tomato plants I have in pots are already flowering. It is the first time I have seen anything like it. So far some tomato seedlings have sprouted in two weeks, and the broccoli has sprouted in just 9 days, so it is ideal conditions for germination. Everything else is yet to pop through, but should be up in the next few days or so. Hopefully, the ground temp will start to heat up over the next few weeks before these tomatoes get too tall for their own good. If I have to remove them early because I will need the space, it will be like traveling from Darwin to Hobart in one day! I hope it doesn’t come to that, but I do have lots of seeds to put in the greenhouse this weekend, so it will be getting mighty full. I checked the radishes yesterday and found a round one the size of an apple. They have been in the ground since Easter, and we have been eating them in salads every so often. They are close to going to seed, so I will have to find a recipe to do something major with them, very quickly. I also have a row of daikon radishes which have been very successful. They look like white carrots, but are quite different. A great spicy crunch, and they grow about 20 cm long. I let two go to seed and they have the most beautiful and delicate variegated pink and white flowers. They brighten up an otherwise green garden in the last month of winter. Kim did think about making a rude photo, but I stopped her just in time. It would have been funny though. Let your imagination run wild, you know you want to! 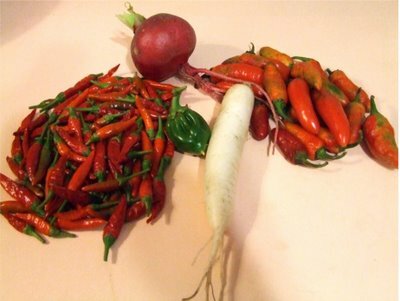 The last of the chilies have been picked with most of them having dried on the bush. We picked a combination of jalapeno and birdseye chilies which I will string on a daisy chain and let dry properly. I think I will plant one jalapeno bush this year, just so that I can make my hot chili chutney. So wicked as a spread on fresh bread and butter, with a kick like a mule! Just the thing to warm you up on an otherwise chilly winters day. Bread is good. Not the store bought white bread that costs a $1.50 a loaf and tastes like glue, I mean the real, honest, home made wholemeal bread. Kim has been busy in the kitchen this afternoon, and came up with these delights. The rolls are for Ben’s school trip to the Werribee Open Range Zoo tomorrow. 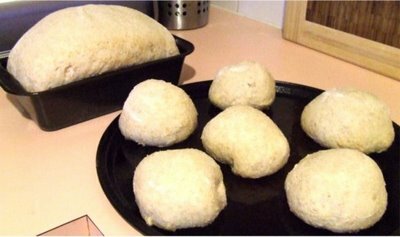 These are photos of just the risen bread just before she cooked them. 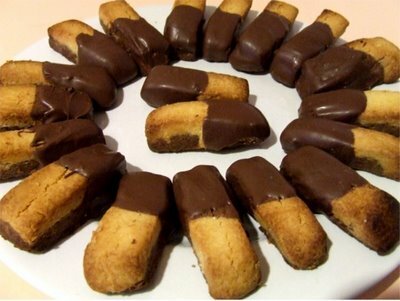 She even baked these tasty shortbread biscuits with one end coated in chocolate. How decedent! I had one this afternoon, accompanied by a cup of rooiboss tea, and the biscuit melted in my mouth. Great effort, love. Why does freshly cooked bread smell so good? Does it take us back to our childhood, or bring back memories of the first time you had a mouthful of freshly cooked bread straight from the oven? Maybe both, but I have read that if you want to sell your house during an open inspection day, either brew a fresh pot of coffee or bake a loaf of bread. Apparently it helps visitors relate to a homely environment and you are more likely to sell your home. What a mighty power freshly baked bread must have over us. I know it has the same effect on me. Whenever I smell our freshly cooked loaf, it makes me feel at home and gives me a warm fuzzy feeling. Kim and I bake bread every single day, and I have probably said this in a previous post, but it costs us about $1.10 a loaf, counting all materials and energy costs. Try and buy a decent 850g wholemeal loaf at Bakers Delight for that price! We make either normal tinned loaves, big or small, or rolls as in the photo above. One day Kim even made garlic monkey bread, but I will let her tell that story. It is about time she wrote a post!